A stripe trim neckline and shirred bodice combine with breathable stretch cotton to create a stylish scoop neck top that doesn't skimp on comfort. Backed by rich industry experience, we are engaged in offering T Shirts. These t-shirts are designed and crafted as per the latest market trends using quality tested fabrics and cutting-edge machines. In addition, we design this t-shirt as per the clients specifications like company logo, color and size. We can also customise design as per your Requirement. 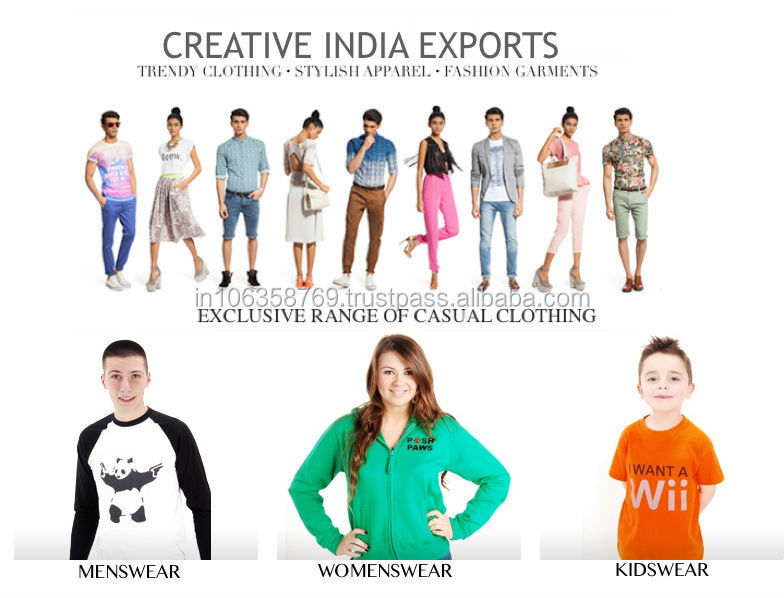 CREATIVE INDIA EXPORTS mainly produces and exports high quality garments aiming different levels of customers, including kids, ladies and men. Our goods are not only practical, but also stylish. 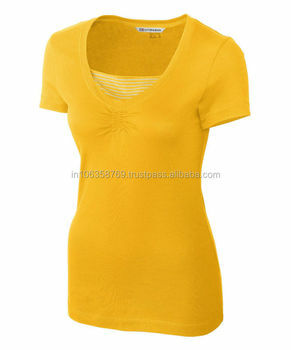 Popular products include Casual & Formal Shirts, Casual & Formal Trousers, Jeans, T-Shirts, Shorts etc. As we are manufacturing, products could be sent directly and promptly to our customers. Thus, we offer services in a timely manner with reasonable prices and quality assurance. From flat sketch to bulk production, customer satisfaction is our main goal. With distinctive cut and innovation use of fabrics, we lead the trend of the season by constantly develop new and fashionable products. Besides garments production, our company also offers design services. With a huge supporting team of designers based in Mumbai, orders by our valuable customers could easily be designed and manufactured. From flat sketch to bulk production, customer satisfaction is our main goal. A Wide variety of Trendy, Stylish & Affordable casual and Formal Apparel for all Men, Women & Kids. To set a precedent in the global garment manufacturing industry through continuous innovation, exceptional products, focused services and enhanced customer satisfaction. A Wide variety of Trendy, Stylish & Affordable casual and Formal Apparel for all Men, Women & Kids. We offer the highest quality garments in a broad range of color, sizes, and styles. All our products feature a stylish and flattering fit. Our brand portfolio includes product lines that range from affordable and mass-market to luxurious, high-end style and cater to children men and women. Always at the cutting edge of fashion and innovation, we have for over a decade now sourced technology, fabrics and garments globally.